Sinsheim - Losing 2-1 at home to FC Bayern München wasn't in the script for TSG 1899 Hoffenheim on Matchday 2, but Kevin Volland's historic nine-second goal certainly was. bundesliga.com: Kevin Volland, are you feeling happy about scoring such a special goal? Kevin Volland: I'm not exactly sure whether it's now the fastest-ever Bundesliga goal. At the end of the day it doesn't matter, there's nothing to shout about when the game pans out like it did. Of course it's nice for me personally, but you want to win every game. Today I think we pushed Bayern enough to have at least taken a point from the game. 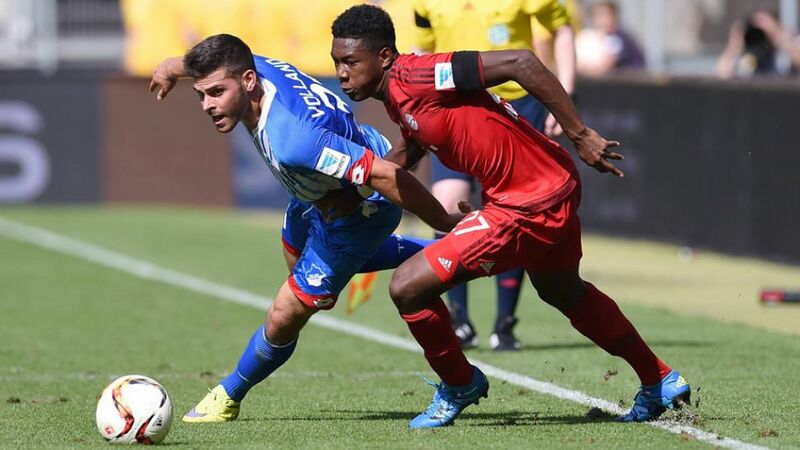 Volland: We set out to go for it and that's what we did, and then the mistake came about. We wanted to put Bayern under pressure from the start. It worked for us. Of course it was a gift. I was in the right place and was able to pounce on the misplaced pass. bundesliga.com: Early goals like that don't happen every day against Bayern, do they? Niklas Süle: It's because we really went for it from the start and chased down every man. That makes even a team like Bayern nervous if you go full throttle. We practised it in training all week and did a good job putting it into action. Oliver Baumann: It went as planned. It's what we set out to do. We wanted to get at Bayern's back three early and wait for mistakes. *(Both Kevin Volland and Karim Bellarabi scored goals that were timed at nine seconds, which is why the record is shared as only whole seconds are considered when timing the speed of goals scored. However, Volland's effort crossed the line a matter of milliseconds - 0.3 to be precise - before that of Bellarabi's). Relive Volland's historic strikeright here.